QUESTION: Do you welcome a Junior or an Amateur coming up and asking you a question or inquiring about their score after a class? Given that judging hunters and equitation is a subjective profession, often trainers, riders and owners want to know the reason their performance was pinned in the judge’s final order. 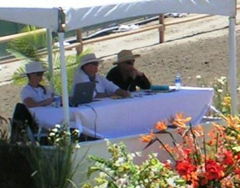 USEF requires a steward be present during a discussion with a judge. We asked our judges how they feel about inquiries into their scoring and placings and sharing their reasoning with exhibitors.